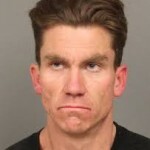 Los Osos resident Ryan Dutra, 35, is accused of burglarizing homes, cars and businesses along the stretch of coastal counties and stealing as many as hundreds of items of property. Dutra has been in Santa Barbara County Jail since Jan. 21 and faces multiple felonies in San Luis Obispo County as well. Arroyo Grande police arrested Dutra on Jan. 19 after he broke into a Chevrolet dealership and stole keys, tools and paperwork. After Dutra posted bail, Santa Maria police arrested him in connection to a burglary. Arroyo Grande detectives have seized about 350 pieces of property from Dutra and are currently sorting out what belongs to him and what he is accused of stealing. Arroyo Grande police are using serial numbers and working with other agencies to link property to owners, Raetz said. “Sometimes there really just isn’t any rhyme or reason to the things that they take,” said Arroyo Grande Detective William Raetz. The police department is also encouraging anyone who is a victim of car theft or home burglary to contact investigators by emailing them at propertyrecovery@arroyogrande.org. Bury him under the pile of loot. Presto! No more robberies from him. People experience very severe injury when their space is violated, home smashed into, car hit, lost data on computers, family jewelry that can’t be replaced. That’s why we have four safes scattered among places. Nobody should have to live that way, with one-man crime wave people like this getting released over and over when somebody should just drop the hammer on them. Very impressive look of remorse…NOT!